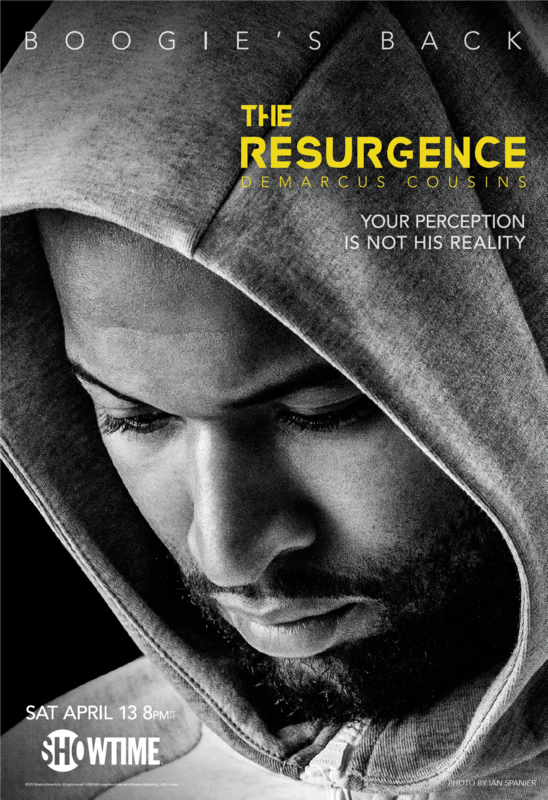 NEW YORK – March 29, 2019 – SHOWTIME has released the official key art and trailer for its new feature-length documentary THE RESURGENCE: DeMARCUS COUSINS, premiering on Saturday, April 13 at 8 p.m. ET/PT. The SHOWTIME Sports Documentary Films original chronicles Cousins, the Golden State Warriors’ power forward, through his grueling comeback from a career-threatening injury and his path through free agency. THE RESURGENCE: DeMARCUS COUSINS provides unfettered access to one of the NBA’s biggest personalities at the most crucial time of his career. To watch and share the official trailer for THE RESURGENCE, go to: https://youtu.be/a-pSvjvtXKM. THE RESURGENCE goes inside the mind of Cousins as he suffers an Achilles injury that has been career-ending for some NBA players. The film features exclusive interviews with teammates, coaches and NBA insiders closest to the story, including John Calipari, who coached Cousins at University of Kentucky, former Sacramento Kings’ head coach Mike Malone, Warriors coach Steve Kerr, current and former teammates Isaiah Thomas, Matt Barnes, Anthony Davis, Kevin Durant, Draymond Green and more. Viewers witness Cousins’ roller-coaster ride through free agency that culminated in a shocking one-year deal with the two-time defending NBA champion Golden State Warriors and join his private and emotionally charged journey back from a devastating injury. Since last summer’s NBA free agency period, the network has released a series of short-form behind-the-scenes clips online to introduce the project. Visit: https://s.sho.com/2DGbouU to watch each clip, including the private moment when Cousins shocked the sports world by announcing that he would join the Warriors for the 2018-’19 season. THE RESURGENCE is created by SHOWTIME Sports Documentary Films in association with Independent Sports & Entertainment and DeMarcus Cousins. The executive producers are Brian Dailey, Diego Pardo, Louis Krubich and Eric Newman. The film is directed by Mitchell Hooper of Malka Sports. It is the latest in a series of culturally significant unscripted programming from SHOWTIME Sports. Additional titles in the lineup include DISGRACED, which won the 2018 Sports Emmy® Award for Best Documentary, the multi-part series SHUT UP AND DRIBBLE, BIPOLAR ROCK ‘N’ ROLLER, and ACTION, a new docu-series exploring the legalization of sports gambling and its evolving impact on the gambling community.